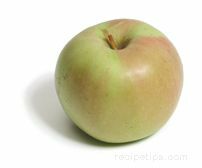 A green to yellow colored apples that is medium sized with a russet area around the stem. The inner flesh is firm textured, white and tart flavored. It is great for pies, applesauce and other cooking needs because of its sweet-tart flavor that intensifies when it is cooked. This variety of apple is generally found in the central and eastern regions of the U.S. The variety found in the western region that compares to the Rhode Island Greening is the Northwest Greening.